What do we mean when we talk about research impact? 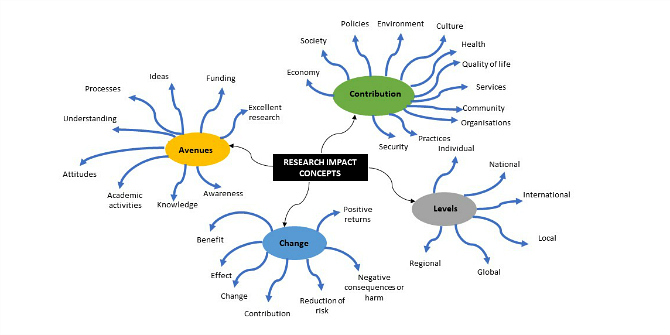 Core elements and concepts that underpin research impact definitions (Source: LSE Impact Blog). The concept “research impact” has been widely used in academic literature, but never clearly defined within the modern discourse. Five Queensland-based researchers, Kristel Alla, Wayne Hall, Harvey Whiteford, Brian Head and Carla Meurk, went on the search and proposed a conceptualisation of the term, especially in relevance to the impact of research when translated into policy. levels of impact (e.g. national, international). Has this challenged the current bureaucratic definitions of what it really means for a research to have impacts? Read the full article here and share your thoughts. Don’t forget to Subscribe to our blog for a frequent digest and never miss a post again!